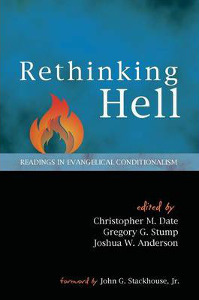 Rethinking Hell: Readings in Evangelical Conditionalism was recently published by Cascade Books. Edited by Chris Date, Greg Stump and Joshua Anderson, this is a collection of modern writings on the doctrine of eternal punishment (the earliest being from Henry Constable, The Nature and Duration of Future Punishment, first published in 1868). The majority of them are written in defence of the doctrine of “conditional immortality,” often abbreviated as “conditionalism,” and often referred to as annihilationism. According to this view, the doctrine of hell as a place of eternal torment in a flaming pit (or anywhere else) is just not taught in the Bible. Instead, the biblical teaching is that the wages of sin is death, and that the only way to have eternal life in any form or place is through Christ and the resurrection to immortality. Those who reject Christ will one day be no more, while those who accept him and find reconciliation with God will live forever, being endowed with the gift of immortality. The Foreword is by John G. Stackhouse, Jr., and there’s no small sea change indicated by that fact alone. At one time the chair of theology at Regent College in Vancouver, one well-known J. I. Packer, dismissed annihilationism as “secular sentimentality.” The man who now holds that chair is John Stackhouse, who not only holds an annihilationist view but wrote the foreword to this book! There is also a preface by Greg Stump, an editors introduction by Chris Date, and two introductory chapters by Peter Grice and me. The range of scholars whose work contributes to the book is impressive: Edward Fudge, Stephen Travis, John Stott, Clark Pinnock, John Wenham, Basil Atkinson, E. Earl Ellis, Ralph Bowles, Harold Guillebaud, Anthony Thistelton, Philip Hughes, Henry Constable, Christopher Marshall, Nigel Wright, Richard Swinburne, Kim Papaioannou, LeRoy Froom, Roger Olson and Ben Witherington III. A couple of these authors are not annihilationists themselves, but offer collegial comments on the evangelical nature of the view. The great strength of this work is that it draws together the relevant parts of works many of which are difficult to obtain and gathers them into one place, saving the interested student a great deal of time, effort and money. generous reviews come from Edward Fudge, I. Howard Marshall, Terrance Tiessen, Claude F. Mariottini and Jim Spiegel. So head on over to the Book Repository (free international shipping!) and get your copy! If you use this link, Right Reason will even get a few pennies when you buy it, and it won’t cost you any more! Episode 005: It’s one Hell of an episode! Posted on June 10, 2014 June 13, 2018 by GlennPosted in announcements, heaven and hellTagged annihilationism, books, conditional immortality, hell, publications. Glenn, do you know if there’s some way to watch online the Rethinking Hell Conference at the Lanier Theological Library? Looks good, but $41 is a bit much for me… will it be released as an E-book? Ciaron, for a scholarly rather than popular book, it’s comparatively cheap for its size (other readers note: the price Ciaron quoted is in New Zealand dollars). But yes, if you look it up at Amazon there either is or will be a Kindle version (I haven’t checked). Andres, the event is being video recorded. I’m not sure in what way the footage will be available. Just had a quick look at Amazon, not on kindle yet. Arrived in the mail today. Looks like a good read! Thanks, Glenn. I’m looking forward to reading this.